Meth at Temple Beth Shalom with Rabbi Shelly Moss. 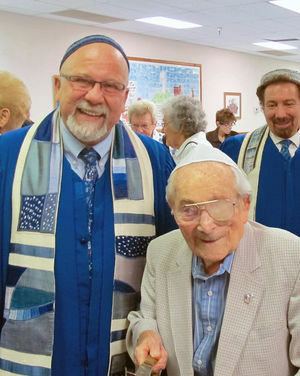 A centenarian who still read the Torah at Shabbat services, wrote an opera and helped several generations of youngsters prepare for their b’nai mitzvah, Abe Meth was a beloved figure throughout the Valley’s Jewish community. For a comparatively brief but brutal and tumultuous time, he also eluded capture by the Nazis, shared the world stage with a man who would become a legend and helped save the lives of thousands of his fellow Jews. Meth passed away on May 27 at the age of 104 – just six days shy of his 105th birthday. Funeral services were held May 30 at Temple Beth Shalom in Sun City. Rabbi Shelly Moss of Temple Beth Shalom and Rabbi Arthur Lavinsky of Beth El Congregation eulogized Meth. The rabbis noted that Meth was especially blessed as he had died on the Sabbath and his funeral took place on Erev Shavuot, the Jewish holiday that commemorates the giving of Torah to the Jews. They also spoke of Meth’s days working with Swedish diplomat Raoul Wallenberg to forge Swedish passports that saved the lives of thousands of Jews during the Holocaust. With a mission that includes locating, giving tribute to and hosting events for many Wallenberg survivors, the International Raoul Wallenberg Foundation (IRWF) took a special interest in Meth in 2012, the year he turned 100. That was also the year the IRWF was commemorating the 100th anniversary of Wallenberg’s birthday, said IRWF spokesperson Nancy Fox. During a special celebration in the Valley for Meth’s 100th birthday, an IRWF representative was on hand to honor Meth’s work. “Not only was Mr. Meth a survivor rescued in Budapest by Swedish diplomat Raoul Wallenberg and given safe haven by Swiss Vice-Consul Carl Lutz at the famed Glass House, Mr. Meth was one of the rare few survivors still living who actually worked with Wallenberg and his rescue mission,” Fox said. Born in 1912 in Budapest, Meth graduated from that city’s Jewish Theological Seminary in 1933. He married his wife, Lillie, in 1939. Then the dark days began. From October 1944 to January 1945, after escaping forced slave labor, Meth, Lillie, their 17-month-old son, Joseph, and Meth’s parents successfully hid from the Nazis at the Swiss safe house located in the basement of an abandoned factory known as the Glass House in Budapest. The Glass House was purchased by Lutz and under the Swiss legation protected and rescued approximately 3,000 Jews during the Holocaust. In an interview in 2012, Meth recalled life in the Glass House. In his time in the Glass House, Meth, a skilled calligrapher, helped Wallenberg forge the Shutzpasses, protective Swedish passports that ensured the carrier that he or she was under the protection of the Swedish government. The Schutzpass also exempted the holder from wearing the yellow star of David, which all Jews were required to wear. After the war, Meth tried to rebuild his life in Budapest, but in 1948, he seized an opportunity to move to the United States. Meth lived for 30 years in the Kansas City, Kansas area, assisting in rituals, teaching religious school and supervising congregation management at Beth Shalom Synagogue. He and Lillie retired to Arizona in 1978, and he became the Torah reader at Beth El Congregation in Phoenix for 32 years and joined Temple Beth Shalom in Sun City. Meth is survived by his daughter, Agnes Oblas of Ahwatukee; his son, Joseph Meth of Longboat Key, Florida; three grandsons; and two great-grandchildren. At the funeral service, attendees remembered Meth’s humor and zest for life, even as he lived into his hundreds. While Meth’s passing is a personal loss to his family and the Valley’s Jewish community, his death also resonates with the keepers of history.